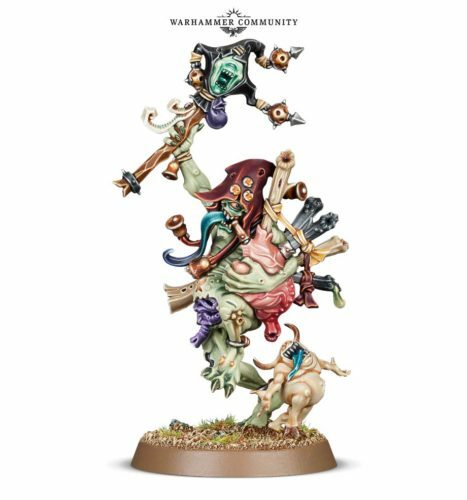 Finally it looks like we will be getting a plastic Great Unclean One. The classic plague sword and chains. 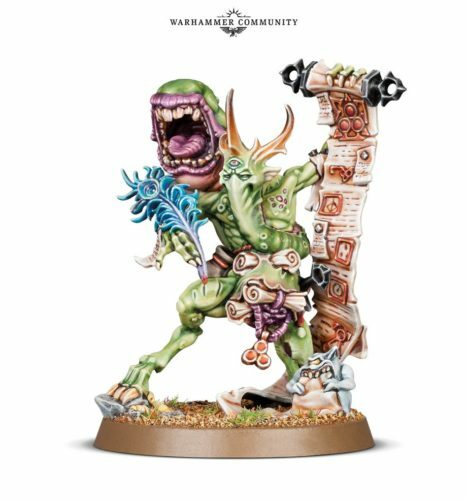 Looks like 2018 is rolling on with the Nurgle thing from GW, just focusing on the AoS stuff instead of Death Guard. Good. I have an AoS Nurgle army but no death guard. Of course with all these Daemons how much effort would it be to paint up a few squads of marines to make a Death Guard army featuring mostly daemons? Not much. And with the easy build models it wouldn't be costly either. Gag me with a spoon. I wonder if you can have a Nurgle Army and a girlfriend at the same time. While I haven't played much of GW stuff recently (game of Man o War about 6 months ago), my freinds seem to really like AoS (more so the rules than the new world). I've always wanted to paint up a Nurgle army but maybe a little more traditional…I do like the idea of warriors on drones tho. Some interesting sculpts there. I wonder if you can have a Nurgle Army and a girlfriend at the same time. Yes, Slaanesh is the army for those without a girlfriend. It looks like the plague bearers are heralds of Nurgle. I like the one with the scroll. Never cared for the look of the nurgle army but if that is your thing, 2018 looks like it will be good to you. Wow, these really do raise the bar. The paint jobs on the last two seem to "clean". The highlights appear to bright. Some ugly mutha' s !!!! The fact that one can have a girlfriend/significate other and still plays with toys is amazing in itself ! Or with more than one ! I have a slaanesh army. But a part of me is wistful for the old days when proper Nurgle armies contained more green stuff than actual metal and plastic. GW has really done an admirable job steering people away from conversions and toward their shiny new models. You can use the new models for conversions! Still waiting to see what they will do for Slaanesh and Khorne in the coming year if at all. Not that I am complaining as I am fine with what I have and its mostly painted. As someone who really loved the Forge World GUO I've been waiting for one in plastic for a while. I have a Nurgle army too for AoS so it is likely that I'll have to get one. It isn't quite big enough for a Greater Daemon to start on the table but they are always such great models to have as the object of a summoning ritual. The goof with the bagpipes is ridiculous. Looks like Jar Jar Binks or a creature from Monsters the movie. The big guy is nice though, if you can say that about Nurgle.